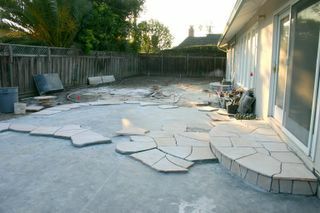 A picture of our backyard as they’re putting in the flagstone — backbreaking, detailed work that takes a super-long time. All these are as of 1/23/2005. This entry was posted on Sunday, January 23rd, 2005 at 5:20 pm	and is filed under Personal stuff. You can follow any comments to this entry through the RSS 2.0 feed. Both comments and pings are currently closed.